We have just had a German exchange student to stay with us for a week. We hit the jackpot, exchange students wise. He was polite, friendly, with a good sense of humour and he actually looked you in the eye when he talked to you. It felt like quite a responsibility to have somebody else’s teenage son for a week. Would he be homesick? Would he be wary about food, or allergic to anything? Luckily there were no such issues. The school laid on lots of trips, but we organized a day of sightseeing at the weekend. We took him to the Cotswolds, then went to Blenheim Palace and walked around the lake and finally punted from the Cherwell boathouse in North Oxford. It was a sunny day, but with a few showers here and there. The showers made the grass smell wonderful. The cooling breeze in the air was perfect. The Cotswold villages shone in a golden light, showing off their gorgeous warm coloured stone. I’d forgotten how pretty Bourton on the Water was, with its sparkling shallow, wide river running all the way through, with low bridges so pedestrians could cross over. Blenheim Palace was even more impressive. We went in using a side entrance, so it took Sebastian by surprise when he rounded a corner and saw the Palace. The sun was out in full now, and the grounds and the many different views as we walked through the park were spectacular. The punting was the best of all – and at the end of his visit our student told us it was one of the highlights for him. 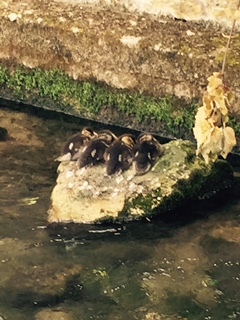 Seeing this very English activity through the eyes of our visitor was special – the lovely Oxford colleges, the baby ducklings following their mother alongside our punt, families picnicking lazily by the river’s edge, the complex patterns of the wind on the surface of the water, and the shadows of the trees. Magical. If you want to look at your home and your town and your country with completely new eyes, I recommend hosting a foreign exchange student for a week. That feeling you get, of seeing things as if for the first time is something to be held on to, and cultivated. And of course as a writer, the more you can see the world that way, the better!